Welcome Back! If you were able to take Labor Day off, I hope you relaxed and had a great day. If you weren’t able to take the day off, I hope you got paid extra for working on this day dedicated to labor and its achievements on our behalf. I was teaching about pageants last week–my American Drama course was reading W.E.B. 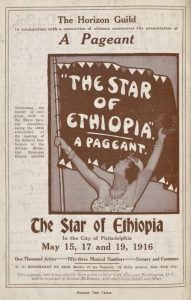 Du Bois’ Star of Ethiopia, and we discussed the purpose and form of pageants, a rather popular form of theatre in the late 19th and early 20th centuries. Pageants were essentially a combination of parade, variety show, and dramatic performance, with music and dance included. Du Bois’ pageant was often held over several days, and told the story of the “Six Gifts” Africans have given to the world, such as iron and spiritual faith. Some productions of the pageant featured as many as 1200 performers and elaborate moveable staging. In 1913, an epic pageant was held in Madison Square Garden in honor of the striking silk workers of Paterson, New Jersey. It told the story of workers striking with the International Workers of the World (IWW), in order to raise money for the striking workers and to educate the public about the labor movement. 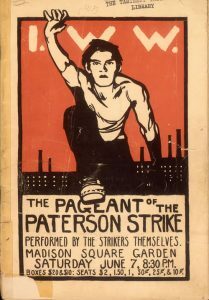 Overall, the Paterson Strike Pageant was not a great success; it failed to make back its money and the strike itself failed and ended after about five months. This was also typical of pageants–Du Bois managed to bring Star of Ethiopia to New York, Los Angeles, and Philadelphia, but could not raise enough capital to tour it further, as it was prohibitively expensive. Pageants depend on scope and spectacle, neither of which are cheap. When asking my students if we had anything similar to pageants today, they had to think hard about it. They closest thing they came up with were ethnic fairs or city festivals, both of which contain various aspects of pageants: music, dancing, narratives about oppressed groups of people, etc. So it’s gratifying to know that in some small way, these new forms of celebration and learning embody themes of these old pageants. But my students just didn’t think today’s audience would have the attention span for a multi-hour, possibly multi-day event. And you know, they could be right! This entry was posted in Academia, Teaching, Theatre and tagged Pageants, Paterson Strike Pageant, Star of Ethiopia, teaching, W.E.B. Du Bois. Bookmark the permalink.